Rosi Robinson - Artists' Statement. Some young children have imaginary friends. I had an imaginary house, accessed through secret backs of cupboards. Inside I could float effortlessly among the shadows, enjoying my aloneness. My childhood was one of freedom, play and exploration into places of liminality: the bomb-site in our street and boarded up broken houses. The cliffs and quarry, the municipal park, the sea. The gasometer, the coal washer, pit wheels and huge ships built in the dry docks. New building sites with scaffoldings, ladders and breeze blocks were a fantastic playground for the imagination. I was often alone but content and curious. As an adult, I can now find such liminality through contemplation, silence and making ... some may call this prayer. These influences emerge through my art as appreciation of architectural structure, both broken and new; pattern, order; land and skyscapes. My repetitive and careful practice of digital drawing invites the presence of a virtual meditative practice. Recently I came across the term 'heterotopia', coined by Michael Focault in the 60's. One interpretation of heterotopia could refer to spaces of otherness, where mental and physical spaces have a chance to merge: such places I know. Whilst living in the celtic Isle of Man such liminal spaces were called 'thin' places - places where heaven and earth meet. Last year, I discovered and photographed a very still place - an overgrown field of derelict allotment huts where the quietude was palpable. The sublimity of place within a field of memories, holding a sense of sadness, displacement, loss and aloness; without a promise of hope. 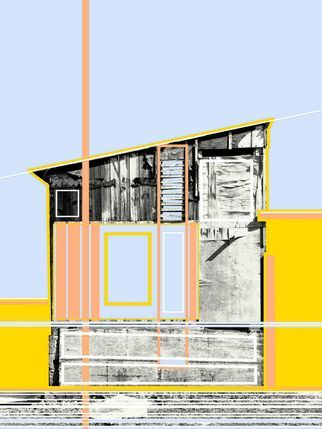 I create new spaces by making reference to, digitally tracing over or expanding found areas within these images of the huts. The limited colour palette is one of hope: colours found in the dawn sky evoking the promise of a new start, a new day. Blue, pink, gold and greyscale towards the creation of heterotopia.